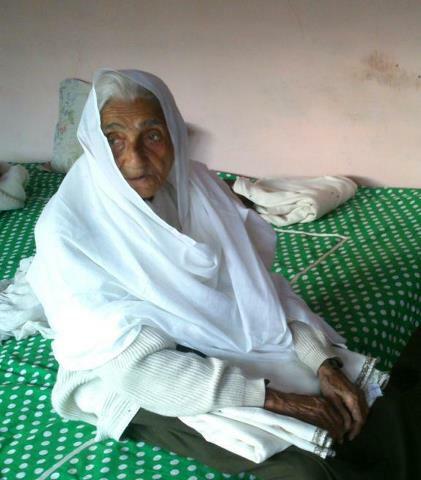 Wirasat - Pargana Chail- Allahabad: An Inspiring Grannie ! I would like to share with you a recent experience of coming across an old lady during a marriage whose lifestyle was not only inspiring but also surprising. I had to stay in the village for a night on the occasion of this marriage. Let me tell you that I am an early riser and normally get up around 5 AM for the prayers etc.. In the same way I got up around 5 AM and looked for my way to the wash-place where I could perform my Wuzu. I could gauge with the spilled water there that there was someone before me as well who too had done wuzu. There was still some time to go for Fajr and I performed few Nafl and waited for the Fajr time. I noticed someone moving in the Verandah on the Opposite direction ? Then I said my Fajr prayers and thought it wise to go out for a walk in the serene, pure and healthy surroundings of the village and enjoy the milieu before the sunrise. I went past the verandah and tried to open the Iron Gate when I heard a feeble, faint voice of a lady " Ko Aaye" . I answered form there only that I was going out for a walk. I saw an old lady sitting on her Ja' Namaz with her Tasbeeh . She nodded her head and then I opened the door. Khalid : Ye aap Tahajjud Parh rahi thin ? Khalid : To Aapki Umr kya hai ? Khalid : Aaap ki Umr ? Khalid : Aap kitne baje uthin thin ? Lady : Sab hui jaat hai, Allahe Karawat hain , hamar kaa Hai ? Khalid : Beshak , Hamare liye bhi dua kar dijiyega ek bar zaroor. Luckily I found her daughter to be bringing morning tea etc and then I took leave from her and forgot to ask her name. I want to ask whether this inspires us , if yes, then what stops us from maintainig a more meaningful life than hers ? What is that eats up all of our time good for nothing , neither good for his world Nor for hereafter ? Stealthily I clicked a snap of hers and would like you to recognize her and make dua that people like her live long and May Allaah swt accept ourselves as well for HIS work and for HIMSELF. To tell you more she is a daughter of Nazarganj and was married in Koh-khiraj. Does anyone know her name ? After posting at Facebook , this entry received so many comments as follows, it also helped us know her name as Shakira Bibi. Mohammad Shariq Zubair Aameen...khalid bhai mai inka name to nahi jaanta hu lekin mai shayad inse mila hu ye Aftab Ahmad, Mashook Ahmad ki walda hai Aur Rehan bhai ki saas hai. Mai sahi hu ya ghalat pls. Bata de. Rabia Basri She is Sakkan Dadi , she is my father's khala.Her elder son Aftab Ahmad is my phupha.If I am not wrong u were attending Ajmal's marriage.She is mother in law of Rehan ph upha. Khalid Bin Umar That's right ! Aman Fatma She is my grandmother ( my dad's mom ) her name is Shakira bibi. Nasar Jafri Aftab bhai Kokhraj wale jo Home guard Department me Company Commandent the unki Amma hai. Aqueela Syed well documented! brings back memories of our grand mothers...May allah bless them!! Khalid Bin Umar I am going to put it on the website Wirasat -pargana Chail as it is indeed an important chapter from Chaili Heritage.